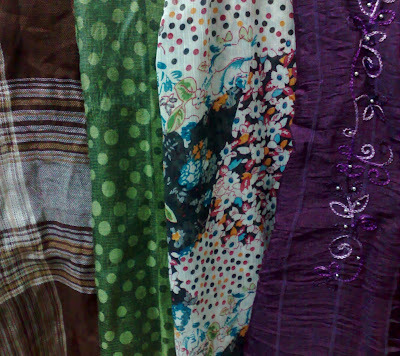 I keep my hijabs in a drawer, like so. I guess I have about 25, alhamdulillah and this drawer is just enough room. Most of the time they get all jumbled, but I'm trying to keep them neat. 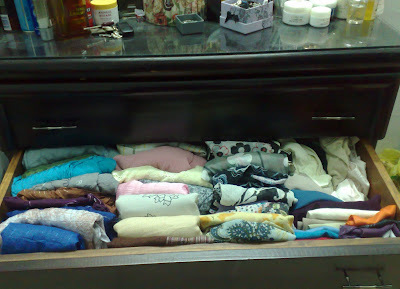 I organize them by size and fabric and keep the under scarves to one side. I'd love to hang them on something like these, but I don't have the space right now. I think the circles one would be the most slip proof, but the other two could keep them less wrinkled. I usually have to iron my hijabs before wearing them, depending on the fabric of course. Some are great and never wrinkle but pashminas and other ones wrinkle just by looking at them. Then there are the ones that are meant to look wrinkly! Let's talk pins. I recently started using hijab safety pins. I'd always used regular safety pins cause I thought the plastic part would show on hijab pins. Naseem told me you just cover it with your scarf! Duh, so they are much, much better than safety pins. More secure and most importantly don't snag on your hijab fabric. As for straight pins, I'm a fan of the little diamond looking ones and the roses, as you can see. 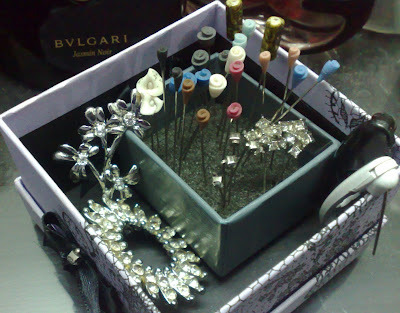 I saw on one blog, it's escaping me now, which, but there were bow hijab pins. Adorable. The snowflake looking ones in the front there, I made those today! Jujey gave me the idea. I used a pair of earings, broke off the back and hot glue gunned the sparkly bit on the top of a pin! I didn't have any plain pins so I took a couple of the ones that have the little rhinestones on them, removed the stone and flattened the back part using needle nose pliers. This way there's more surface area for the glue to stick to. How do you store your hijabs/scarfs? What about pins? 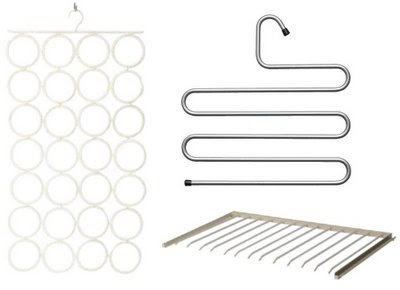 i think the scarf holder on the bottom right hand would be better because you feed the scarves on horizontally, because the more scarves you put on the vertical ones )the other two) the more bulky it would get. mine are in a chaotic mess of drawers. i just bought a crapload more from my trip, so i was just thinking today about new storage ideas and subhannaAllah you did this post. I agree with you the circle one is the best because you just pull the scarf through. The other two require folding before you put them on, also, the other two require overlapping, more mess when you want to get one scarf out. With the circles, you just put one or two scarves in each loop! Less work, less mess. Jaz, thanks. Lets see if I can keep it that way. Ange, I know what you mean, it would be neater. Rana, it's easier and holds more but they'll be all wrinkled and squashed. Unless your scarves are narrow and folded thin. BTW, great job on making the pins! And I do wear my scarves wrinkled, they stretch when I put them on....LOL! I keep mine in a drawer like you do. I have tried to hang them on a hanger similar to the one you have on the top right, but mine was plastic...I found it required too much work, and they keep falling off onto the floor. I guess it depends on how patient you are! Pepita, They're everywhere here in Egypt. Where are you at? I have something like that circle thing from IKEA which is for all my shayla/pashmina stuff... I also have a big rubbermaid type of bin I toss underscarves/laces/ amiras/ and the occasional square scarf. I'm not the most organized person, but it works for me lol. Pins I keep in a dish in the bathroom where I put my scarf on normally. And my wallet. And the van. And my jewelry box lol. I always keep extra pins just in case. I don't use safety pins either, I use straight pins to hold at the chin. Never had a problem yet, and it saves your scarf from a lot of wear and tear. As far as the fancy pins, I just wear from my store. I'm kinda like a raccoon, I like shiny things lol. Alsharifa.com, That'll work. I have a couple pins in my purse just in case too. UmAsiya, the magnetic dish sounds like a nice idea! Pepita, aha. I found these sites. TheMrs, The back of the door thing is a good idea..so many pockets. I was just thinking of this as I ironed my scarves for the gazillionth time and thought wouldn't it be nice to have something that could be mounted to the wall with lines across and clothespins that just clip the already ironed scarves vertically by the corner. You can see all your scarves, can be organized by length, you dont have to fold em (cuz, let's be real ladies, who of us folds and puts away their scarf as soon as they take it off?) and best of all no ironing... Still working on the design but I'll keep you posted when I come up with it...Behind a door might work, or in the back of a closet... Any ideas? Pins I keep in a pin cushion right where I put the scarves on. Good post cuz we all have to deal with this jumbled scarf mess. Eman , that's a really good idea. It could look cool too! I hate ironing plus I've ruined a few hijabs that way. Your drawer is so neat. How do you keep it this way?I've tried everything and still can't find something that works for me. With drawers, all my scarves used to get mixed up and it was a biG mess. I couldn't find anything, so I tried hangers, with that, I ended up having one side of my closet full of scarves and lost useful closet space. My last resort was to get the Ikea circle hangers like the one you have on the picture and I'm still using them though they're not working either. My small scarves fall out of the holes while the big ones drop very low and the weigh of the scarves drags everything down, so I'm still looking for a new way of storing them. My perpetual dilemma. Can I scream HELP? Hijabee, I just fold them and put them in rows. When I take one out I put it back in the front of the row. Someone needs to invent the perfect, space saving, non wrinkling, easy to see hijab storage system. Drawer for me too Mona. The ones I use the most always just seem to hang by the front door though. I think the one with the circles would be the best. I love the pins as well. Pablo, Sorry, No Habla Español.